Love may or may not be Taiwanese director Doze Niu’s answer to Love Actually, but it certainly plays that way. A crowded, multi-narrative picture that explores the ups and downs of love, it’s an elegantly packaged affair, much like that Rowan Atkinson number in Richard Curtis’s film. Niu corrals eight of Taiwan’s biggest, most beautiful stars, which includes himself and technically an actress from the Mainland, and sets them against a chic, cosmopolitan backdrop. It’s high gloss and vibrant hues all around, but if the glamour and good looks of its mostly young stars work to pull in its audience, they do little to heighten the drama; this is a movie first about polish and then about plot. One of the more challenging situations involves someone heaving himself into a septic tank to prove his devotion to his girlfriend. Otherwise, there are few truly hard decisions to be made here, and the storylines tend towards the garden variety. An actress (Shu Qi) is arm candy for a director (Niu) but finds herself most at peace with a stuttering waiter (Ethan Ruan). He is brother to a cyclist (Ivy Chen) who’s just discovered she’s pregnant by her best friend’s (Amber Kuo) other half (Eddie Peng). The friend is daughter of the director, which brings us back to the actress, who is just ending an affair with an uptight businessman (Mark Chao). His inability to love is tested when he meets an estate agent and plucky single mother (Vicki Zhao) in Beijing. There’s a real struggle between Chen and Kuo’s characters to do the right thing, once they figure out what that is, and the two actresses dig at the uncertainty that comes with abandoning oneself to love. Peng, however, flops around a bit looking hapless, a guise most of the actors here seem to adopt. Though they have proven their talent elsewhere, they are only as competent as their stories and Niu never really pushes his characters far enough. Chao, for example, increasingly lays bare his vulnerabilities but never quite closes the emotional gulf between his character and the audience. It’s as if the messiness of despair and heartache just might overpower his tailored image, and so he holds back. The same is true for Shu Qi. Zhao flirts around a little more; her character is a harried woman more concerned with shuttling between her job and her son’s school than making sure every strand of hair is pinned in place. The only character that doesn’t seem to mind being immersed in the swill is a police officer (Wang Jingchun) who gets tangled in Chao and Zhao’s storyline. He has the benefit of not having to look like an Armani ad and comes off more human, and humorous, because of it. 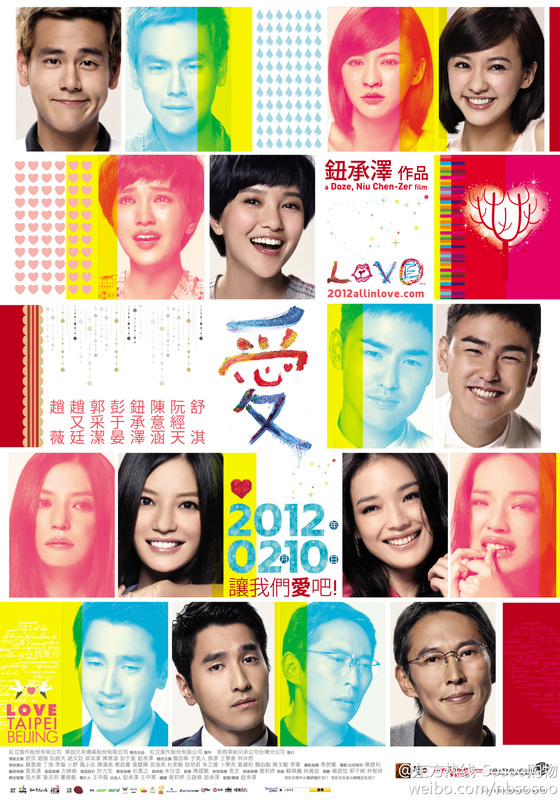 Posted in Asian movie reviews, Taiwan and tagged Chinese movie reviews, comedy drama, Doze Niu, Eddie Peng Yu-Yen, Ethan Ruan Ching-Tien, Ivy Chen Yi-Han, Mark Chao You-Ting, romance, Shu Qi, Vicki Zhao Wei on August 29, 2015 by limmer13. Jay Chou, kungfu, and basketball sound like decent ingredients for a fun if not exactly award-winning film. But that doesn’t turn out to be the case, and in fact, a high school basketball match in a musty gym has more heart and drama than this turkey. Filmmakers fail to turn its star’s oft-professed love for kungfu and basketball into a coherent fantasy, and it’s shameful how flagrantly it ends up violating all rules of good storytelling. Chou features as the Shijie the Basketball Orphan, abandoned near a basketball court and raised in a kungfu school. He’s an extremely capable student, so much so that he gets locked out one night for showing up a teacher. An encounter with Zhen Li (Eric Tsang) leads him to a club where the pair ends up conning their way through a darts game. That results in a massive fight, and in a matter of 24 hours, Shijie is again kicked out of the school, this time for good. But Shijie must get through a few hurdles before he can burst onto the collegiate scene, including a one-on-one with the team captain, Ding Wei (Bolin Chen). It’s the first, and last, climactic encounter of the film, and that’s because the remaining matches never really build up to anything. Even the classic showdown that ends the film, wherein Shijie’s former teachers come to his aid, is so absurd and not in keeping with any actual basketball rules that it feels like someone’s cheating. With no sense of league structure or standards to ensure fair competition, there’s little tension or consequence. This lack of a discernable athletic goal creates an obvious dramatic vacuum that the writers try to fill various subplots. Ding Wei turns out to be a boozy star while his sister (Charlene Choi) is the chipper groupie who’s crushing on the team’s other brooding stud, who only has room in his heart for his dead girlfriend. A better storyline that isn’t pursued with much vigor but that might have been more rewarding is Shijie’s father-son relationship with Zhen Li. But this is also an afterthought, given undue and confusing attention at the end of the film but not throughout. The writers try to convince the audience that Zhen Li really cares for his friend when exploitation seems closer to the truth. For once, Chou’s presence doesn’t help much. Surprisingly bland in this role, though more the fault of the lifeless script, he fails to give shape to his quiet character, something he’s managed to do in previous films and even music videos. One would expect that the action would make up for these plot and character deficits, but the kungfu and basketball sequences prove less than stunning. Aside from a legitimate fight at the beginning of the movie, the action consists mostly of high wire jumping and dunking. Chou gets a few chances to show off his agility with the ball, but on the whole, the picture doesn’t earn its title. Posted in Asian movie reviews, Taiwan and tagged action movies, Charlene Choi Cheuk-Yin, Chinese movie reviews, Chinese New Year movie, comedy, Eric Tsang Chi-Wai, Jay Chou, martial arts, Ng Man-Tat, sports on June 6, 2015 by limmer13. Love You 10,000 Years – Another attempt by Vic Chou at being a “real” actor, or what I wish he’d say to me every night. [Switching off fangirl.] This movie follows his well-received performance in the television series Black and White (痞子英雄) in which he played against type as a roguish police officer. He continues to veer from his sweet ‘n’ sensitive image, here by looking like a dirty, crumpled piece of paper. Chou doesn’t shed the boy band persona completely though; he plays Qifeng, a rock musician with the Electro Monkey Boys who also has serious commitment issues. None of his relationships lasts more than three months, and after each breakup, he goes back to bumming around with his mates. Meanwhile in Japan, Sakurada (Kato) has two job offers. She is hired by way of a marriage proposal to be the wife of her longterm boyfriend; she sensibly declines. A company gives her a more reasonable position, which she accepts, but she must spend three months in Taiwan to brush up her Chinese. Sakurada jumps at the opportunity to explore a new place and to escape her parents. Things get off to a perfect rom-com start, which is to say they begin miserably. She gets drunk on her first night, crashes Qifeng’s show, and then smashes his guitar. Her second night is just as unlucky when the two end up on a bus driven by a vengeful henpecked husband. He leaves them stranded in the middle of nowhere, a very good place to begin a romantic relationship, or a murder spree. It’s the former, and soon, Qifeng and Sakurada decide to try out a tidy three month affair. They draw up a contract outlining the terms of their romance, including a clause that stipulates a fine for prematurely ending the relationship. Living together proves to be more difficult than they anticipate, however; Sakurada berates Qifeng for his lack of good housekeeping skills while he cannot tolerate her nagging. Neither the script nor the direction takes full advantage of Chou and Kato’s endearing chemistry, and their characters’ feelings for each other vacillate from hot to cold. Individual moments between the two come across genuinely but the relationship as a whole doesn’t reveal itself as naturally as it could have. The movie is also hurt by a protracted ending that keeps the leads apart for fifteen minutes too long. Nevertheless, Love You 10,000 Years is a fun film that utilizes many tools in its genre. It’s spiced with musical interludes and punchy cartoons, and the movie is especially buoyed by the charm of its supporting cast. Na Dou steals a few scenes as a cross-dressing landlord while Moon Wang, of Meteor Garden fame, takes an amusing turn as a Chinese language teacher. Sakurada’s foreign adventures will also be familiar to those who have worked or studied abroad in Asia, except for that falling in love with Vic Chou bit. Posted in Asian movie reviews, Taiwan and tagged Chinese movie reviews, Hao Lei, Huang Teng-Hui, Kato Youki, Li Bo-En, Mimura Takayo, Moon Wang Yue, Na Dou, romantic comedy, Taiwan movie reviews, Vic Chou Yu-Min on August 25, 2013 by limmer13.